We have posted some new features related to our entree.NET and ELECTRONIC ORDER PAD software this week, that I wanted to point out to be sure that you and your DSR's (Distributor Sales Reps) take advantage of. But first, an update related to the Android version of the ELECTRONIC ORDER PAD. As some of you know, we haven't released an Android version yet because many of the devices we've tested had slow performance that was unacceptable. However, it appears that this is now changing for the better. This week we finally got our hands on the new $199 Google Nexus 7 tablet... and we were impressed! 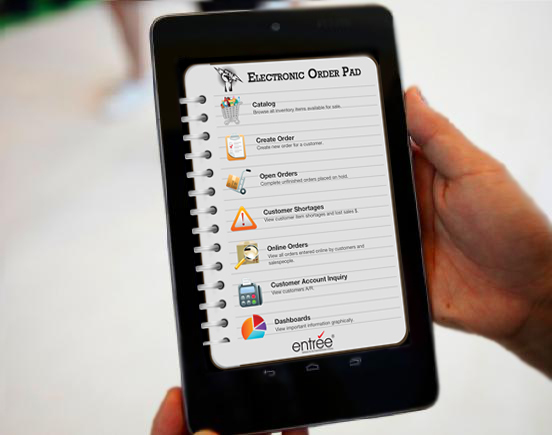 Our quick review showed the tablet to run the ELECTRONIC ORDER PAD app just as fast as an Apple iPad 2. Because it is running on a smaller, 7" screen (vs. the Apple iPads 10" screen), we need to tweak our software so that it displays properly on the smaller display, without cutting off columns, etc. It runs the new Jellybean version of Android, which appears to work exceedingly well. And it's powerful NVIDIA Tegra 3 processor is the key to the fantastic speed of the unit. The only downside we immediately see is that it only comes with built in WIFI, unlike the Apple iPad which as WIFI and optional 3G/4G data service from Verizon or AT&T. However, this might not be that much of an issue when you realize that many smartphones have the option to make the phone work as a mobile WIFI hot spot. So if the DSR was not in a WIFI zone, but his smartphone had the mobile hot spot feature turned on, then the Google Nexus would gain Internet access through the phone. It also means you wouldn't have to purchase its own data plan for the Google Nexus. Just use the plan for Internet access that already is part of your smartphone contract. So this would actually be a cost savings. 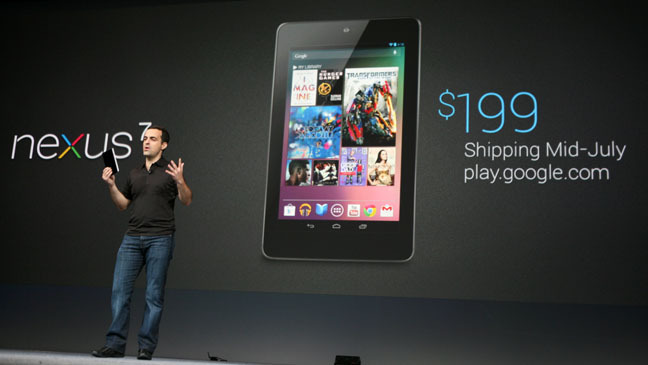 The bottom line is that for a $199 tablet, it is quite the value! Look for more information regarding this tablet as we enhance the ELECTRONIC ORDER PAD to run on it's smaller screen size. Click here for more information about the Google Nexus 7 tablet. Language Translator is now live! As described in my previous Blog of May 28th, 2012, our Language Translator is now live and operational. You can enable it by logging into your entree.NET system as the Administrator and following the prompts on the new "Translation" tab. For a detailed guide for using the Language Translator, please click here to view our PDF document. This first feature is releated to entree.NET only. A later version will incorporate this into the ELECTRONIC ORDER PAD. It allows you to define the Brand's you would like to feature when your customer's and/or salespeople log in to place an order. The purpose of this feature is to bring a Brand with sale items, or a Brand you want to give some attention to, with the end result of helping you sell more product. The customer benefits by seeing items that they might not normally have exposure to and taking advantage of sale pricing that they might not have been aware of. You can define unlimited Brand's to feature, and they will rotate as the user is placing their order. When the user clicks either the "Shop Now" button, or anywhere on the Brand image, entree.NET will then display all of your items of that Brand. 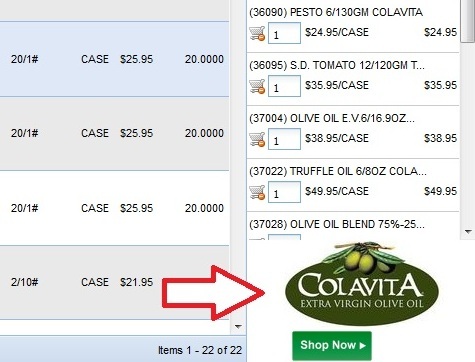 Note that you can also specify if only those items which you have marked with special or promotional pricing should display to the user, rather than all. If the customer qualifies for sale pricing, they will see both their normal price and also the sale pricing and when it expires. Not a big fan of the Apple Date Picker Spin Wheel? Neither were we! It is a bit hard to use and took more time to pick a date than most DSR's have patience for. 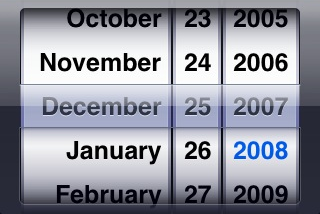 Dates that are not selectable are shown in light red / pink. If a date is not selectable, it is because it is either in the past or not available for delivery because of your defined delivery date selection rules. There is now full support for Delivery Date selection rules which were previously only supported in the desktop version of entrée.NET. 1. Max Order Days Sets the number of days from the order date that the delivery date must fall within. Enter a number value. Enter zero to disable rule. 2. Max Order Days enforcement Sets the order entry system response when the delivery date is beyond Max Order Days number. Allow for next Delivery Date. 3. Order Cutoff Time Sets the daily cutoff time for orders to be delivered the next day. Select a time from the drop down list. 5. Restrict Delivery Dates to Customer Route Information Enforces the customer’s defined route delivery days from the Customer file Route tab. No Customers Only. A common request by DSR's using the ELECTRONIC ORDER PAD, is a way to see their customer's shortages for the day. Many times the DSR would call into the office to receive this info, which would take up time for the office staff. To address this issue, we've included a new menu option called "Customer Shortages". Only orders that have been submitted to the main entrée system and have been printed as an invoice are used when generating shortage information. When the "Quantity Shipped" is less than the "Quantity Ordered" it is interpreted as a "Shortage". This feature will make it easier for you to take care of shortage situations with customers early and avoid losing future sales. 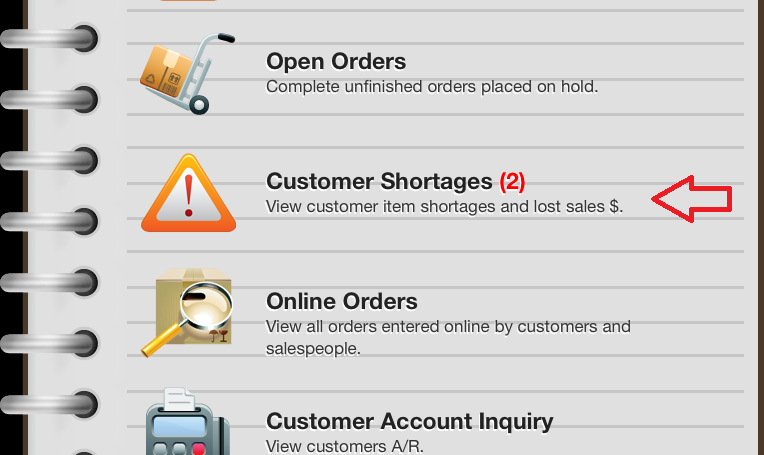 The red number next to Customer Shortages in the menu tells you the current number of shortages for the current day. The default view displays a list of invoices that have a shortage that are scheduled for delivery on the current day. The ELECTRONIC ORDER PAD will calculate the "$ Lost" caused by these shortages, which ultimately impact your company's bottom line, as well as the DSR's commission. You can enter a new date or enter a date range to check for shortages. Customer shortage item details may be viewed by tapping the invoice in the list displayed. Tap the View Invoice button to see the entire customer invoice. When a DSR is creating an order with the ELECTRONIC ORDER PAD in front of a customer, the customer can't help but want to see what he is doing with his tablet. This usually impresses the customer greatly, until they see the Gross Profit and Commission Info that displays at the bottom of the screen! It seems that many of your customers expect you to make next to nothing, and are surprised to see that the DSR might actually be earning a commission. Even though there is a user option to turn this off, many DSR's prefer to keep it available for them to view as they create orders. They just wanted a way to handle these awkward times when a customer might be looking over their shoulder. This scenario led to another highly requested feature that we call the "Quick Hide" of the Gross Profit / Commissions. Now hitting the white arrow pointing to the right, will slide the Gross Profit / Commission info back into view. We have many more features planned for both entree.NET and the ELECTRONIC ORDER PAD, so stay tuned to my Blog and our Feature Flashes for more information!